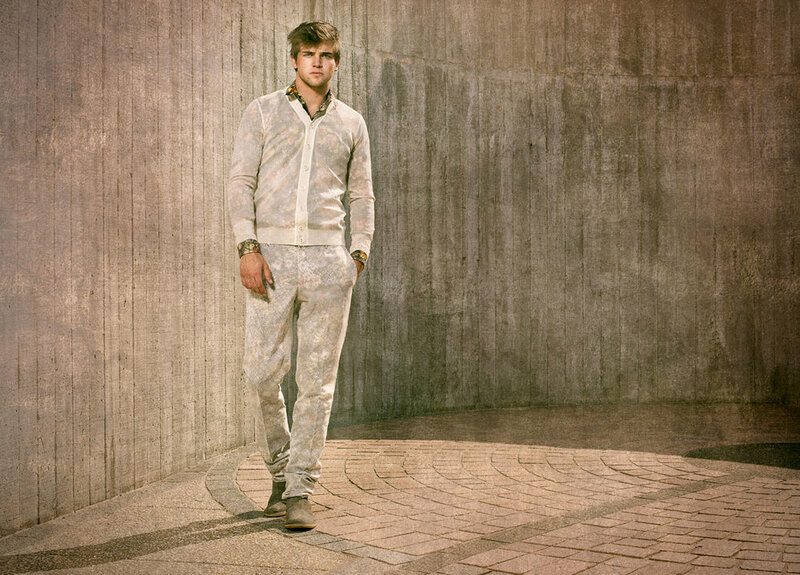 Cotton printed blazer with high armhole and knot buttons, cashmere crew neck pullover, linen short sleeve shirt, cotton jockstrap shorts, cotton shorts, cotton necktie, cotton high socks and canvas shoes by Thom Browne. Cotton double-breasted sleeveless jacket, cotton short sleeve button-up shirt, cotton pants, and two-toned leather shoes by Jil Sander. 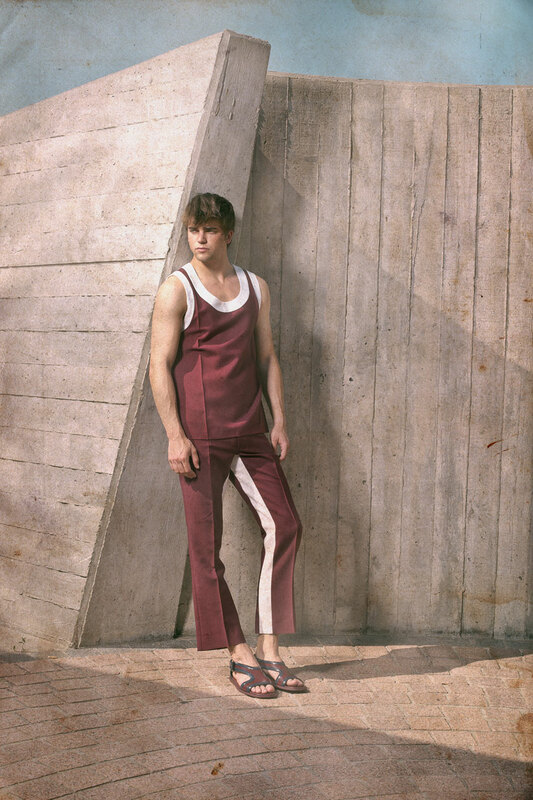 Nylon and mohair tank, pants, and leather sandals by Prada. Rayon single-breasted jacket, linen pants, and canvas shoes by Giorgio Armani. Wool blazer, wool vest, and wool sleeveless sweater by Dior Homme. 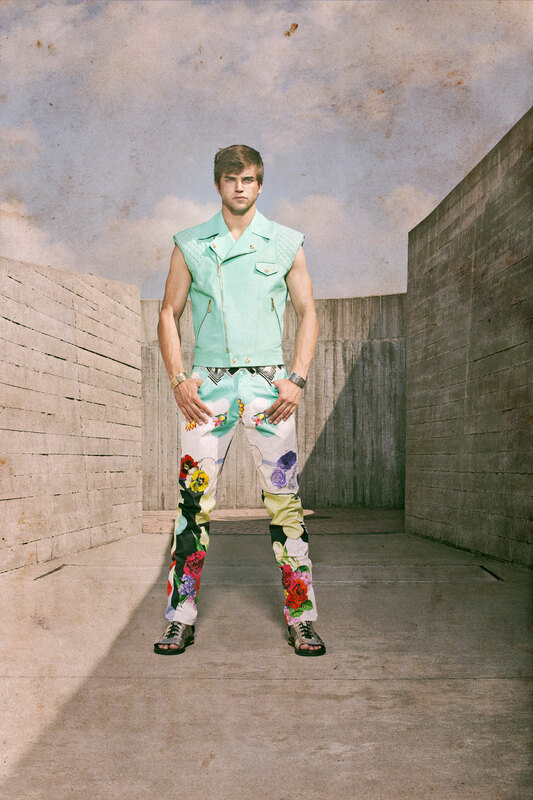 Lambskin leather vest, cotton trousers, leather belt with multicolor buckles, and leather sandals by Lanvin. Cotton rayon short sleeve shirt by Calvin Klein Collection. Silk blazer and pants, cotton button-down shirt, leather shoes, silk tie, pocket square, and prescription glasses by Tom Ford. Nylon-wool cardigan, cotton floral shirt, nylon-wool pants with cotton floral print lining, and leather Chelsea boots by Bottega Veneta. Leather sleeveless motorcycle jacket, cotton printed pants, brass bracelets, and patent leather gladiator open toe boots by Versace. Wool flap-pocket blazer with reverse press buttons, cotton button-up shirt, wool low waist easy-fit shorts, and leather shoes by Raf Simons. Cotton jacket, cotton button-up short sleeve shirt, cotton shorts, and desert boots byLouis Vuitton.